Altaro Oops! Backup for Windows 8, 7, Vista & XP Free Giveaway Worth $2000. This is a good opportunity for the Windows users to get a copy of your own. This Altaro Oops! Backup Giveaway is almost sure shot to get if you apply soon as the number of users of Altaro Oops! Backup for Windows 8, 7, Vista & XP Free Giveaway will be low compared to any consumer grade software. Using its ReverseDeltaâ„¢ incremental technology, Oops!Backup will only back up the actual changes you make to a file “ without needing to back up the whole file again every time you make a change. Highly tuned file-change-detection technology ensures that you are protected at all times. Automatically keep a double-backup to protect against theft, fire or loss of your backup drive. Choose the locations where you want to back up to; offices can choose to backup to their server or NAS drive.. Automatically initiates a backup once the backup drive is connected to the computer. How to Participate in This Altaro Oops! Backup 50 Licenses Free Giveaway Worth $2000 ? Applying for the licenses is simple; visit the Altaro Oops! Backup giveaway webpage listed below and upload a screenshot of your Hyper-V Manager (To prove that you’re a Hyper-V user). Expect an email with the license keys Just our way of saying thanks and supporting the Hyper-V community following a successful year. Hurry up as the giveaway expires on December 24th 2012! Note the licenses are Not-For-Resale (NFR) keys. Disclaimer : TheCustomizeWindows has absolutely no liability, expressed or implied for this Altaro Oops! 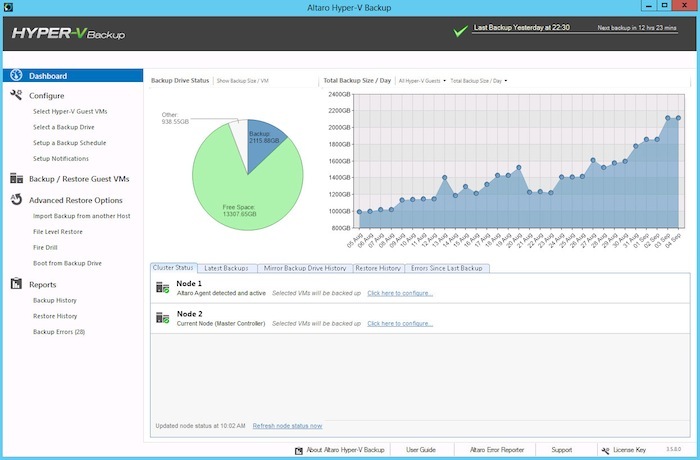 Backup Giveaway or any issue generated for the use of Altaro Oops! Backup software. TheCustomizeWindows recommends using Ubuntu 12.04 LTS or OpenSUSE or Debian Linux or CentOS or any Linux Distribution or Apple’s OS X 10.8 for a virus free environment. This Article Has Been Shared 4532 Times! Cite this article as: Abhishek Ghosh, "Altaro Oops! Backup for Windows 8, 7, Vista & XP Free Giveaway Worth $2000," in The Customize Windows, December 5, 2012, April 25, 2019, https://thecustomizewindows.com/2012/12/altaro-oops-backup-for-windows-8-7-vista-xp-free-giveaway-worth-2000/.